We are only three weeks from the days being longer than the nights. Even though it is cold and inhospitable at times, there are many signs here that Spring is coming. 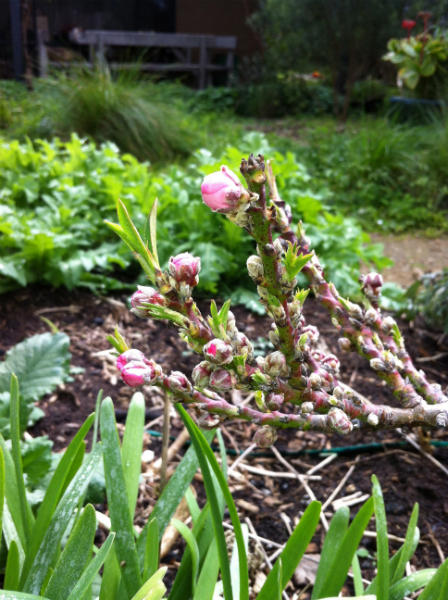 Jonquils and daffodils are bursting as are the almond and nectarine blooms. Broad beans have started surging taller. Perennial herbs are awakening with new growth. The birds are up earlier and chattering away. In Celtic times, the time before Equinox, when the life giving forces of spring pulsed through the earth again, was called the Imbolc, literally translated as "in the belly"- When birth is imminent and yet stilled held within the womb...conditions are being readied. That is where we are now. While visiting family and friends this winter, we were able to visit three CSA farms, two of which have been running for over twenty-five years. We went with lots of questions, which were answered...and then some. We started at Pumpkin Ridge Gardens with farmers James and Polly. Their CSA feeds 180 families weekly. We were very curious about the sizes of their greenhouses, packing house and coolroom and also how they were irrigating and managing their water resources. Pete saw a wonderful manure spreader which is used to spread the tonnes of compost James makes each season. Pumpkin Ridge provides seasonal produce year round. So we also learned about extending our harvest season into the cooler months and how to protect the early spring crops from damaging weather. They took us to La Finquita del Buho, with farmers Lyn and Juvencio Jacobs, which feeds 70 families weekly. The conversations ranged from greenhouses bent under the weight of snow, to varieties of beans, to their goats and pigs, a new cool room and the owls living in their beautiful old barn. We also went to Crossroad Farm where I worked for five seasons. Tim and Janet Taylor have been providing a full variety of seasonal vegetables to their local community for thirty years. While Polly and James are farming 5-7 acres and Lyn and Juvencio 2 acres, Tim and Janet have 60 acres under cultivation. The scale is different from what we will ever be but it was wonderful to see that even on that large scale, simple hand tools and seeders are still used extensively for many of the crops. I was very keen to learn more about growing mesclun mixes and "lazy" lettuces (baby lettuce leaves) in hopes of being able to include that in the shares this year. We have come home with many ideas and launched right in. The shire has approved our application to purchase the two acres behind us. Pete has pulled out fences, slashed the paddock, pegged out the irrigation and is busy incorporating organic compost into the earth in preparation for the vegetable starts to be planted in a few weeks. Last fall, we were able to begin applying the biodynamic sprays to the new earth. We resume our monthly applications this month. Our seeding has begun for the Summer Share. Germinated seed in the greenhouse includes capsicum, eggplant, chillies, cherry tomatoes, purple and green cauliflower, broccoli, cabbage, leek and onions, fennel and celery. We are continuing to trial new varieties in search of the tastiest fruits and vegetables that grow the best here- in this soil and climate and for our seasons. The Summer Share will run for 3 months starting 1st December. We will be growing enough food for 65 families - so to get involved or to find out more please click this link for the Summer Share.